Ask not what your country can do for you; ask what you can do for your country’ – John F. Kennedy. These are words Anuj believes everyone in Nepal, and in particular Nepal’s Private Sector should aspire to live by. He believes that the Business Community must be at the forefront of building a New Nepal. Anuj has been instrumental in reshaping Vishal Group’s strategy towards building sustainable long term core competence and focusing on verticals such as Distribution, Financial Services, Cement and now Hydropower. He is a passionate advocate of building businesses that match the needs and resources of Nepal, and are therefore long-term drivers for the economy. 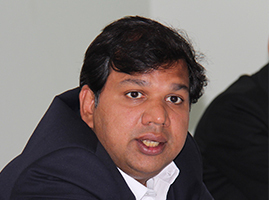 Anuj is Vice-President of Confederation of Nepalese Industries (CNI), and sits on many of CNI’s developmental committees. Anuj is a Director of Vishal Group.